MATERIA MEDICA - Medikamentu Informācijas Centrs. Welcome to the virtual quarters of the scientific, practical and informative journal "Materia Medica". The journal has been issued since 1995. Since 2000, "Materia Medica" is being published in 12 issues a year (you won’t get it in July, but once a year, a double issue comes out). 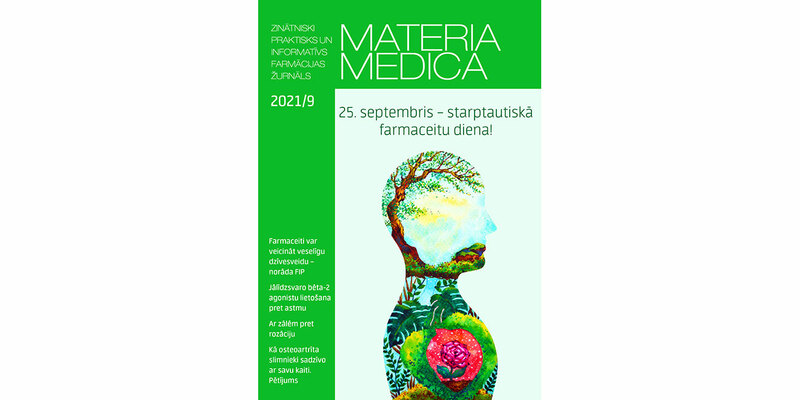 Pharmacists’ Society of Latvia supports the publishing of "Materia Medica" and participates in its preparation. The main audience of the journal are Latvian pharmacists and pharmacists’ assistants, although there are also physicians, nurses, pharmacy students and pharmaceutical companies among the subscribers. Thanks to the supporter of the year, "Materia Medica" finds its way to every Latvian pharmacy and pharmacy branch. Each volume contains news about life and work of the colleagues, information about medicines, analysis of clinical research data, review of the medicine market, current legal information and opinions on what happens in the field. The price of an issue is 2.20 EUR. Annual subscription costs 27.50 EUR. For members of the Pharmacists’ Society of Latvia, students, retired persons - 17.60 EUR. The journal can be purchased or ordered at the Medicine Information Centre.